VIDEO showing a smoking crater next to a motorway has lead to speculation it could be a UFO crash site. 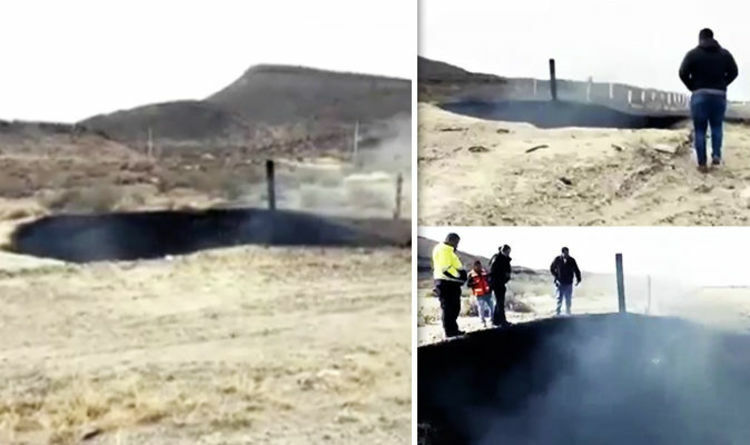 The huge 26 feet across burning pit was filmed by shocked onlookers as a thick mist rose into the air by the Torreón to Saltillo highway in the state of Coahuila in north east Mexico. It was said to be as deep as it was wide and, according to reports, no evidence has been found as to what caused it. Online theories have ranged from a crashed spaceship or a meteor falling to Earth. It happened on January 17 and the video was uploaded to YouTube the next day, before racking up tens of thousands of views, Dailystar.co.uk reports. It is not the first mystery burning hole to have been found in Mexico. SMOKE HOLE: Onlookers were baffled by the mystery burning crater. Some burning holes in Mexico have been used by criminal gangs in the past to torch weapons, drugs, or even bodies.Others remain unexplained. These holes can also be used by gangs to burn bodies, weapons and drugs. Others believed the crater could be linked to the increased sightings of meteors recently. However, officials have said that no meteorite fragments have been found nearby. Meteors regularly bombard the Earth, but most break up in the atmosphere or land in the sea rather than leaving an impact crater. Those that do break up will sometimes leave fragments on the ground, which people are keen to collect. Last Tuesday, a bright meteor briefly swept across the sky over parts of the US Midwest and Canada which caused a powerful explosion rattling homes and astonishing onlookers. The official explanation from experts such as NASA was that a meteor had entered Earth’s atmosphere and burnt up upon arrival. Just after Christmas in the Urals region of Russia, night was briefly turned to day after a meteor is believed to have exploded in the atmosphere. Russia has seen one of the worst meteor incidents in recent years. In February 2013, an unknown 19-metre meteor came from nowhere to explode in the sky above Chelyabinsk, Russia, with the force of 500,000 tonnes of TNT. And the energy released shattered glass on hundreds of buildings and more than 1,000 people were injured as a result.